Editor: What will happen to Point Loma’s Fresh & Easy after it closes is anyone’s guess at this point. After spending more than $1.6 billion, Tesco, the world’s third- largest food retailer, has finally thrown in the towel and announced the closure of its Fresh & Easy stores. This move brings closure to the British company’s effort to establish a foothold in California’s highly competitive grocery industry. Many analysts believe this decision has been a long time coming, with Fresh & Easy stores never seeing the kind of market penetration that the U.K.-based giant expected from the chain. Investors cheered the December 5 announcement, but U.S. workers have reason to celebrate too — this marks the end of a five-year struggle with Tesco. Like most new entrants into the grocery market field, Tesco planned to operate non-union. Indeed, a Tesco employee-relations director described the primary responsibilities of that job in an advertisement as “maintaining non-union status” and “union avoidance activities.” The United Food and Commercial Workers union (UFCW) sought to organize the company, called a boycott and Tesco resisted. In 2009, a series of reports from UNI Global Union accused the company of rejecting a legitimate recognition request to form a union in one California store and claimed Tesco employed only part-time workers in the U.S., thereby preventing employees from earning a living wage. As a result, according to glassdoor.com, the average British Tesco Customer Assistant reported earning $11.05 an hour, while his Fresh & Easy American counterpart reported only $10.12 an hour. Another article detailed insufficient pension and health benefits, and the company’s policy of forcing staff to count sick leave as holiday time off. Unsurprisingly, the reports from UNI Global Union also described pretty deplorable labor conditions at Tesco-related factories in Thailand, South Korea and elsewhere. Tesco’s stance was a surprise to some, given that the company is largely union in the U.K., but the trends are the trends, and another major retailer seeking to come to Los Angeles has fairly well established the pattern. Of course, Fresh & Easy didn’t fail only because of its labor practices. Its signature self-checkout system was not only confusing for the general public, it was also considered dangerous by many. A 2009 report by the Los Angeles Alliance for a New Economy (LAANE) titled, “Self-Checkout: Is It Reliable for Selling Alcohol?” showed the potential for minors to purchase alcohol; of stores with only self-checkout registers, 32 percent of participants under the age of 30 were not asked for identification when the system called over an employee, and 20 percent of all participants were able to bypass employee verification altogether. This study and others like it prompted Governor Jerry Brown to sign Assembly Bill 183 into law on October 9, 2011, requiring all alcohol purchases to be made at full-service registers. Tesco tried to sell itself as a solution to L.A.’s problem of food deserts, much as Walmart and other companies have done, but the promises have failed to live up to the reality. In fact, of the 13 Fresh & Easy stores that opened in the chain’s first month of operation, only one was in a census tract with significantly high poverty rates. Hemet, a town in Riverside County with two major supermarkets within a half mile, could hardly be called a food desert. A recent map from freshandeasy.comclearly shows their progress in locating inside Los Angeles’ inner-city neighborhoods has been limited at best. And with that, we bid sweet adieu to you, Tesco, the multinational corporation that never cared much about the welfare of us Angelenos. May you be the first but not the last to go. They haven’t announced the closure of Fresh & Easy stores – not yet anyway. They’ve announced a “Strategic Review” which will likely lead to the closure or sale of the stores but it hasn’t been set in stone yet. I never liked the stale, sterile feel to their stores. It was exactly like the supermarkets in Britain. I love, love, love Fresh & Easy stores. Very convenient!. Good selection of commonly needed items and great produce. Products are rotated out so there is variety. I will miss the red pepper humus, cilantro salad dressing, honey yougart, white bread and especially the clearance isle. Kinda sad, really. They were working on a build out up the street from my house. There had been a Ralph’s in there previously. Now part of the space is a CVS. I did shop at another Fresh and Easy and while the selection of organics was hit or miss, it was not a bad store. I guess the Albertson’s can continue to charge what they want at will. I’m a current employee at fresh & easy, and this is probably the best job I’ve had. The benefits and paid time off is something not all jobs offer. The pay is great too, I’ve been with the company three years and my pay is at 10.90. I hope we don’t close. No closures have been ever announced. This article is crap. They’re under review and most likely be sold off. There is a F&E by my house here in Orange County that just opened up, my family likes the prepared meals and the overall quality of the foodstuffs. I was really surprised to find, though, that there is only about 1.5 rows of produce in the store, including the free-standing displays in the center of the aisle. Seems to me that a store with the name ‘Fresh’ in its name might have a little more selection than that. Aside from that most produce items had only about a dozen choices to pick from, which was really puzzling, considering how other nearby stores had lots of additional variety at about the same price. Things were selling, but it sort of felt like picking things up at a food bank, what with the small-ish display boxes and limited choices. One other thing I found interesting was that there was two full aisles of alcohol and soda, more store space than produce. Weird. Bread choices were also limited, and dairy was expensive. Not a winning combo. I will say, though, that the staff was always pleasant and accommodating, which is a big plus for me. On the whole, I found shopping at F&E a bit odd – limited produce selections at local market-rate prices, higher dairy prices and limited bread selection, in a brand-new facility with odd, spotlight lighting throughout. It got down to where I was only going there at the end of the day to scope out the discounted items. What a bummer. I hope someone picks them up and keeps the stores open. TESCO hasn’t announced its closing the stores, don’t jump the gun like its factual, that makes this story untrue and leaves MUCH to be desired. My friend was completing the Fresh & Easy employment process and was notified that the job was canceled because they were closing their stores. You can thank the anti-business state of California for chasing another corporation out of our state. It’s amazing there is a functioning business left. It is a dissappointment to hear of this possible closing & end to the store. My family and I love the fresh choices of the already prepared tastefully delicious foods that make it so convienent for me to have dinner ready for my family saving time in the kitchen after coming home from a long day at work. There are so many choices from different cultures that allow us to entice our tastebuds to try new foods. We are tired of the regular supermarkets stale offerings. I do hope they get bought out so they can continue a healthier way for us to shop at reasonable prices. 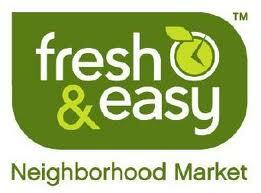 I loved Fresh & Easy but in my opinion they did not do their location survey. For instance I shop at one located in Manhattan Beach, California. They are located just across the parking lot of Trader Joe’s which has low prices, sell liquor and is well established in the community. Not far away is a Costco membership store and a Whole Foods like market. I think that they would have had a better chance if they opened near a Ralph’s (Kroger) or Von’s (Safeway) market because Fresh & Easy had better prices and produce than the aforementioned. So sad to see them go. I’ve been shopping Fresh and Easy ever since opening in Fountain Valley years ago. I think they should add another name to their name – Fresh and Easy and Fast. I loved not having to stand in line to be checked out. Loved checking myself out and their low price fruits and vegetables; and their in store made breads, and meats, fish and prepared meals. With labor relations like that I’ll not be shopping there anymore! Prices are high and take advantage of those in areas where their are few competiors. But in those areas that have a full scale supermarket nearby the dont have a chance. I drive a bentley and dont shop their i go to wal mart or whatever gives me the most bang for me and alicia and gas my ride. For anybody who doesnt believe they are closing up shop, or thinking that the author of the article is jumping to conclusions…I’d say that perhaps you are being naive. As of this past Friday, there have been clear signs at corporate that they are in ramp down mode at this point. All job postings have been suspended and closed out , and some other steps have been made to get the company ready for closure. On the contrary, if the company was planning on continuing this division, they would continue business as usual to ensure that it was a healthy company ready for purchase to anyone (which includes, continuing to hire employees for critical functions). I have it from the horses mouth what is happening at the Point Loma location. Yes, Tesco is throwing in the towel but it is looking to sell a stake in F & E to a joint co-owner to help run the stores. Ideally, if they can find one, the most profitable of the F & E’s will remain pretty much as usual. Barring that, there have been discussions with certain large retail chains (Walmart) about taking over some on the locations. Trader Joe’s did express interest in the specific Catalina Blvd. Pt. Loma F & E but that is still up-in-the-air. By this time next year, my source told me F & E will either be closed entirely or sold off and run as a F & E or other market. One bright spot about all this, the source I spoke with did tell me that Tesco is offering employees “a generous severance package” and many will have first dibs at being rehired at any new stores that come out of the F & E closure/merge. I am shocked to hear this news. When reading the whole blog I have been surprised that no one mentioned about the F&E coupons which are unique. No other supermarket gives such a 20% discount coupon like F&E does. I wish it can continue to offer these coupons as long as possible. I do enjoy shopping at F&E and it will be missed. F&E closure would force me in the future to come back to Costco, which is far from where I live. Merry Christmas and Happy Holidays to everyone! I hope Fresh and Easy dont close, but wake up, someday Wal-Mart is going to own everything. Wal-Mart is an evil company. You want to talk about an antichrist, Wal-Mart is it. Shame, as I moved here from the UK and I could find some of favorites from over there. If F&E do close, I will particularly miss their British Back Bacon. The US bacon is composed of mainly fat and one has to look with a microphone to see the meat.